Foundations of Gas Dynamics covers supersonic and subsonic flow phenomena where compressibility of the fluid cannot be ignored. It finds application in jet and rocket propulsion systems as well as handling industrial gas flow at high speeds. Students and engineers in the mechanical, aerospace, and chemical disciplines will find it useful. It begins with basic concepts such as isentropic flows, shock, and supersonic expansion waves in one dimension. These are followed by one-dimensional flows with friction and heat exchange. Two-dimensional theory with small perturbations is presented, with its applications illustrated by supersonic airfoils. Method of characteristics is used for flows with two independent variables, either with two spatial coordinates or with time variations in one dimension. In later chapters, acoustic wave propagation, supersonic flow combustion, and unsteady shock formation are treated thoroughly. 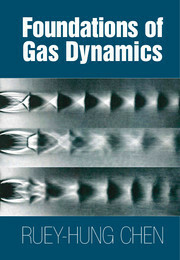 The book ends with a chapter on basic hypersonic flow, with a discussion of similarity rules. 1. Properties and kinetic theory of gases; 2. Basic equations and thermodynamics of compressible flow; 3. Acoustic wave and flow regime; 4. One-dimensional isentropic flow, shock, and expansion waves; 5. One-dimensional flows in channels; 6. One-dimensional flows with friction; 7. One-dimensional flows with heat transfer; 8. Equations of multidimensional frictionless flow subject to small perturbation; 9. Applications of small perturbation theory; 10. Method of characteristics for two independent variables; 11. Unsteady flow; 12. Introduction to inviseid hypersonic flows. Ruey-Hung Chen is currently the Robert G. Myers Professor and Head of the Mechanical and Aerospace Engineering Department of New Mexico State University. Prior to this appointment, he was a professor at University of Central Florida from 1993 to 2015. Between 2012 and 2015, Dr Chen served as the Director of the Combustion and Fire Systems Program, as well as the Acting Director of the Thermal Transport Processes Program, from 2014 to 2015, of the National Science Foundation. His research interests include combustion, heat and mass transfer, and compressible flow. Dr Chen received his Ph.D. degree in Aerospace Engineering from the University of Michigan and his B.S. in Aeronautical Engineering from National Cheng Kung University in Taiwan.